Resources for Teaching and Learning in Archaeology. Archaeobotany has been a key part of archaeological science since the 1970s, and although the tried and tested techniques that form the basis of this study area (basically playing with buckets, water and sieves) have remained unchanged for decades, the research field continues to give new insights into the past as new sites and periods are studied. Archaeobotany (or palaeoethnbotany in America) usually refers to the study of plant macrofossils – seeds, fruits, leaves, twigs, nuts etc. Basically any plant remains which can be seen (just about) with the naked eye. Plant microfossils – starch and phytoliths, also come under the umbrella of archaeobotany, but I’m going to stick to the big bits here. Plant macrofossils are all retrieved by either flotation – breaking up anywhere between 1-40L of sediment in a tank of water, and collecting the plant remains which float on the surface, or sieving – passing the sediment through a stack of sieves. The flot or sieve residues are then studied under a low power microscope, usually only up to x40 magnification. Archaeobotanists study plant remains preserved by four main types of preservation. These are very important to keep in mind, as they effect which seeds are preserved in the first place, how the seeds are separated from sediment, how hard it is to identify the seeds, and what type of information they are going to give us about past societies. Second – mineralised plant remains. This is a pretty rare type of preservation. It normally occurs in cesspits, when calcium (from animal bones, marine shells, egg shells etc.) and phosphate (from human waste) enter into seeds/fruit stones, and form calcium-phosphate. This material will survive for millennia, but the range of casts and impressions formed (individual cell replacement, interior casts, exterior casts) can be tricky to identify. 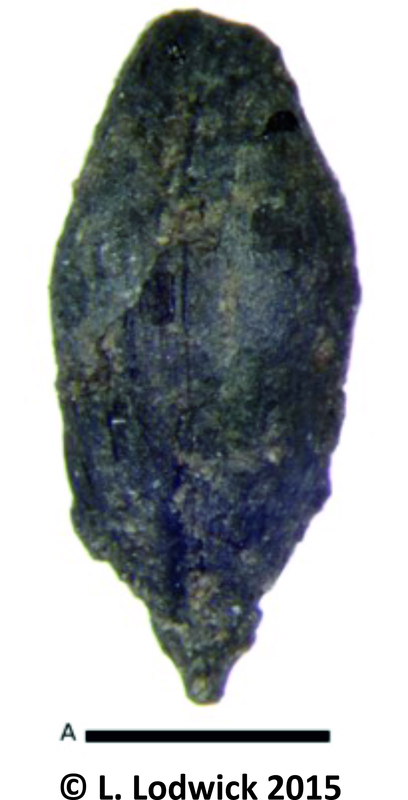 Nevertheless, mineralised plant remains provide us with fantastic evidence for diet and trade in plant foods, mainly for the Roman and Medieval periods. Third – desiccated plant remains. In hyper-arid places (think Egypt) the bacteria which would usually decay plant remains cannot do so without any water. So, huge quantities of straw, cereal chaff, fruit stones and seeds survive in middens, mud bricks and in occupation deposits within buildings. Studies at trading settlements on the Red Sea have provided fascinating evidence for spices which were traded from India to the Mediterranean, and also more everyday activities like animal foddering and crop-processing (Van der Veen 2007). Finally, waterlogged plant remains are in a way most similar to desiccated plant remains, but decay is stopped in this case by the lack of oxygen rather than water. Plant remains have to have been dumped into the standing water at the bottom of deep pits or wells, or discarded in towns with damp climates (like York!) where the rate of organic rubbish dumping was faster than decay. Waterlogged plant macrofossils are also preserved in off-site sequences, such as peat bogs and palaeo channels. The study of these usually falls under the realm of palaeoenvironmental studies. The great thing about waterlogged plant remains is that they include plant foods which do not need to be exposed to fires during food preparation – like fruits, flavourings and vegetables. So, waterlogged samples typically produce a much more diverse range of plant foods than charred samples from the same site. Plus, waterlogged preservation is much more common than mineralisation in north-west Europe. My research focuses on the development of “oppida” in the Late Iron Age and into the Roman period, and what the societies were like which inhabited these settlements. 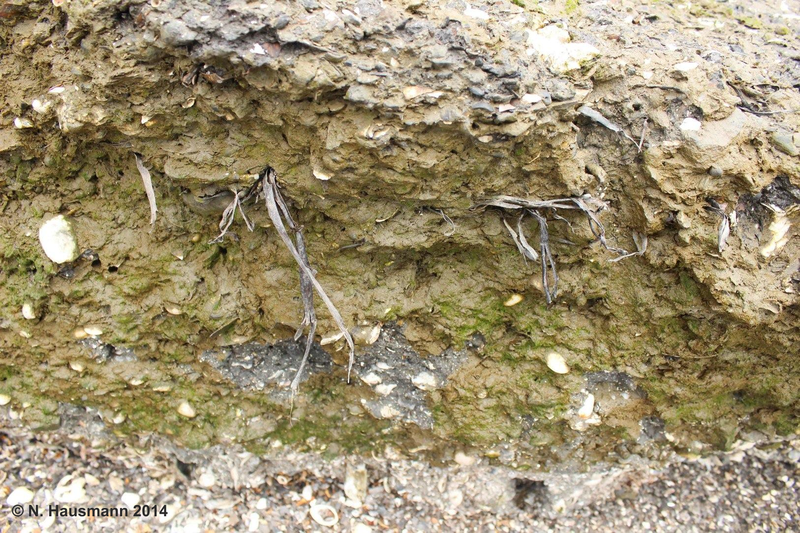 Whilst sampling for plant macrofossils has been widely undertaken for around 40 years, no oppida has been excavated during this period in a large enough scale, or with enough attention to systematic sampling (large well-recorded sediment samples from a wide range of deposits and site phases). So, we don’t know what foods the inhabitants were eating, and whether what crops they grew, and how they grew them, had to change as people decided to live in the first proto-urban settlements in Britain. 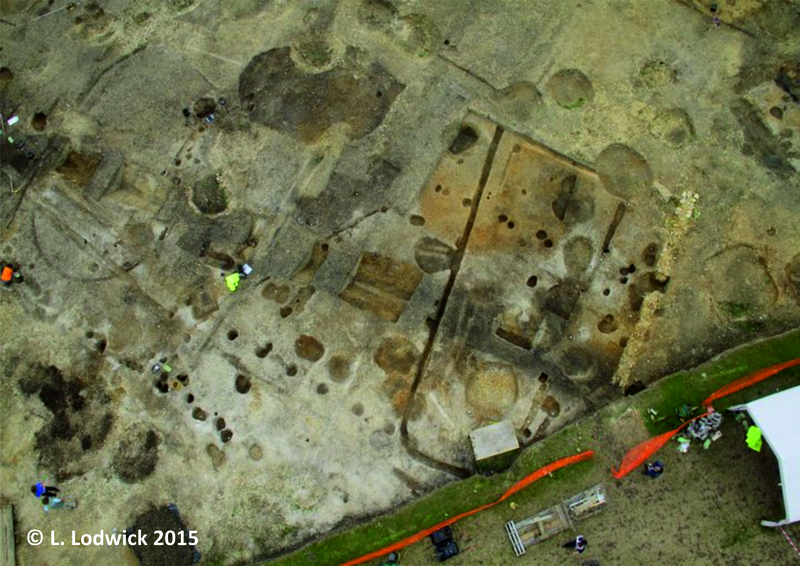 Luckily, the University of Reading Silchester Insula IX ‘Town Life’ Project has been excavating a large area of the oppidum Calleva Atrebatum over the last two decades. The reliance on wells for water supply to the settlement in the past, combined with the bulk sampling for plant remains throughout the excavation, meant a large dataset was available for study. 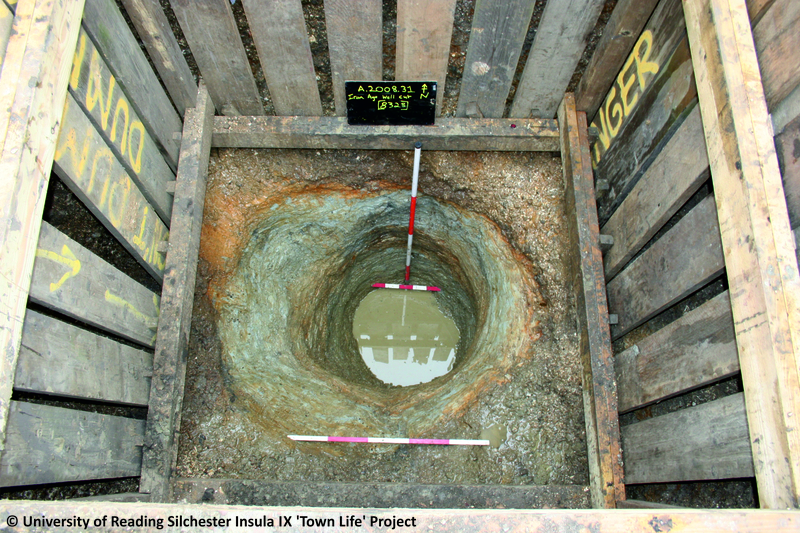 Two Late Iron Age wells contained waterlogged plant remains. Whilst most of the sample consisted of seeds of weedy plants, which would have been growing around the mouth of the well, around 5% of the sample contents were seeds of cultivated plant foods. Several seeds of celery and coriander were present, alongside a few pieces of olive stone. These foods were previously thought to have been introduced to Britain by the Roman military after the Roman Invasion in AD 43, but we now know that some of the inhabitants of Late Iron Age Silchester were selectively adopting some of the plant foods being consumed elsewhere in the Roman world. The archaeobotanical dataset from Insula IX also includes substantial charred and mineralised datasets, showing both continuation and change in farming and food consumption practices across centuries of occupation there. Whilst my research so far has focussed on the systematic application of long-standing archaeobotanical techniques, the development of new methods of statistical analysis, combined with exciting developments in the areas of crop stable isotope and aDNA analysis, means archaeobotany continues to provide new insights into the past. Lodwick, L. (2014). 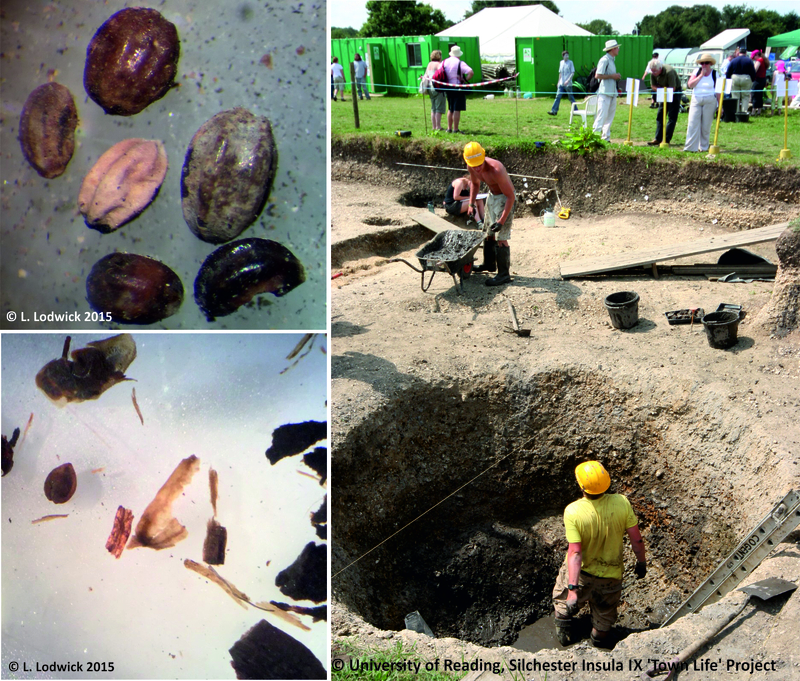 Condiments before Claudius: new plant foods at the Late Iron Age oppidum at Silchester, UK. Vegetation History and Archaeobotany 23: 543–549. Van der Veen, M. (2007). Formation processes of desiccated and carbonized plant remains – the identification of routine practice. Journal of Archaeological Science 34 (6), 968–990. Lisa Lodwick is a Post Doctoral Researcher at the University of Reading, her current research focuses on analysis of plant macrofossils from Silchester. Lisa completed a BA in Archaeology and Anthropology and an MSt. in European Archaeology at the University of Oxford, before pursuing a PhD in Archaeology at the same institution. Lisa’s PhD research focussed on agricultural and social changes during the Late Iron Age to Roman transition period in Britain, identifying changes and continuities in consumption and production patterns. She occasionally blogs about her own research at https://theplantremains.wordpress.com/ and tweets much more frequently about archaeobotany @LisaLodwick . Lisa is also one of the team behind the successful Not Just Doormice – Food for Thought blog https://notjustdormice.wordpress.com/. Although bone is seemingly never changing and durable, it is a tissue subject to constant change and prone to degradation throughout the life of an organism and beyond its death. These changes heavily affect the amount of information that remains available and visible to us and the way we should handle it. Especially in biomolecular archaeology, this is of crucial importance, since the degree of degradation usually dictates the suitability of the sampled material for analysis. Diagenesis represents the entirety of chemical, biological and physical processes occurring within a material or an organism during its conversion from the biosphere (sum of all ecosystems on earth) into the pedoshpere (outermost layer of earth), or in the case of archaeological samples its conversion from the biosphere to the state of preservation achieved by the time of excavation or analysis. Diagenesis as a process is generally understood in its separated components but as a whole phenomenon affecting the decomposing human body it remains a concept difficult to grasp in its entirety and variability. There are a number of key criteria to consider when assessing the potential degree of degradation of human remains in an archaeological context: humidity, temperature, soil acidity, soil composition, biology of the individual at the time of death, postmortem body treatment and burial. Hydrology, temperature and soil composition will commonly be the deciding factor as to whether an environment is suitable for a good preservation and whether it will be aerobic (environment rich in oxygen) or anaerobic (environment poor or devoid of oxygen). This is important since most microorganisms involved in microbial degradation will be aerobic and therefore require an environment rich in oxygen to thrive, accordingly an anaerobic environment will generally have significantly less microbial activity, although a number of specialized anaerobic microorganisms will still be active. Each of the aforementioned criteria are often highly dependent on each other and have the potential for an immense impact on the final overall preservation achieved in the archaeological record within the conditions set by the combination of criteria present locally. This is true for the present and the past, since it cannot be assumed that the environmental conditions affecting an archaeological context have remained unchanged since its deposition (Guellil 2013; Hedges 2002; Nielsen-Marsh et al 2000). The exterior appearance of a bone or tooth has generally little to do with its overall preservation and can be very misleading. Instead of examining the exterior surface of a bone we have to take a good look at its microstructure. Typically, this is done by analysing the material histologically either via SEM or light microscope. Different degrees of bone degradation as seen on two histological section from human bone samples, Coronation Street, South Shields, UK. Photos: © M.Guellil, University of Sheffield 2013. Bone is mainly composed of hydroxyapatite and type-1-collagen, with the mineral portion making up 60-70% of its weight and the remaining 20% organic portion being composed of 90% type-1-collagen. The preservation of hydroxyapatite and collagen are closely tied together in the bone matrix and form a structural symbiosis. Collagen breakdown is subject to some debate but is generally considered to be caused by bacterial collagenase and hydroxyapatite breakdown is caused by inorganic weathering, e.g. soil acidity. However, the structure of bone is such that if one is broken the stability of the other will be in jeopardy (Currey 2006; Dent et al 2004; Gill-King 1997; Guellil 2013; Trueman and Martill 2002; Weiner 2010). The loosening of the bone matrix caused by collagen leaching usually leads to a facilitated access to the bone for microorganism, who in turn will increase the porosity of the bone by tunneling through the already damaged and weakened matrix. Generally speaking these agents are divided into microbial and fungal degradation and leave very distinctive marks on the bone microstructure called microscopical focal destruction or MFD. After skeletonization the survival of bones is mostly dependant on inorganic weathering and mechanical stress. Ideally speaking a good preservation of skeletal remains is guaranteed in a neutral or slightly alkaline anaerobic cold environment (Dent et al. 2004; Jans et al. 2004, 87; Weiner 2010, 113-114). Two histological sections from human bone samples, Coronation Street, South Shields, UK. The section on the right has been photographed under polarized light. You can clearly see the collagen fibrils, showing up as birefringence on the slide and the corresponding darker, already damaged sections of bone. Images © M.Guellil, University of Sheffield 2013. The degree of degradation affecting bone is generally considered to be set at a very early stage of its deposition and seems to be subject to very little change after ca. 500 years and literature has been debating about the origin and characterisation of the agents affecting bone degradation. To predict anything when so many factors are prone to variability is a challenge that can only be addressed by collecting more data and gaining an understanding for the small links that hold the bigger picture together (Guellil 2013; Hedges 2002; Hollund et al. 2012; Trueman and Martill 2002). With new technology and screening techniques emerging, which are able to deal with sample degradation up to a certain level, we can now extract viable data from degraded materials, from which we would not have been able to sample in the past. However, the final yield itself and its quality will always depend on the degree of degradation and the depositional environment the sample source was subjected to. Meriam Guellil is a Research Associate in the Biology Department at the University of York, working within the BioArCh Research Cluster. Her research focuses on Ancient DNA, BioInformatics and Taphonomy, working on a range of samples from Canada, Italy and the UK. Meriam completed a BA in Prehistoric Archaeology and Early History at the University of Vienna, Austria, followed by an MSc in Human Osteology and Funerary Archaeology at the University of Sheffield. Dent, B.B., Forbes, S.L. & Stuart, B.H., 2004. Review of human decomposition processes in soil. Environmental Geology, 45(4), pp.576–585. Currey, J.D., 2006. Bones: Structure and Mechanics, Princeton University Press. Gill-King, H., 1997. Chemical and ultrastructural aspects of Decomposition. In Forensic taphonomy: the postmortem fate of human remains. CRC, Boca Raton, FL. pp. 93–108. Guellil, M., 2013. Determining the Intensity of Microbial Degradation in Selected Skeletal Elements. Unpublished Dissertation, University of Sheffield. Jans, M.M.E. et al., 2004. Characterisation of microbial attack on archaeological bone. Journal of Archaeological Science, 31(1), pp.87–95. Hedges, R.E.M., 2002. Bone diagenesis: an overview of processes. Archaeometry, 44(3), pp.319–328. Hollund, H.I. et al., 2012. What Happened Here? Bone Histology as a Tool in Decoding the Postmortem Histories of Archaeological Bone from Castricum, The Netherlands. International Journal of Osteoarchaeology, 22(5), pp.537–548. Nielsen-marsh, C. et al., 2000. The Chemical Degradation of Bone. In Human Osteology: In Archaeology and Forensic Science. pp. 439–454. Trueman, C.N. & Martill, D.M., 2002. The long–term survival of bone: the role of bioerosion. Archaeometry, 44(3), pp.371–382. Weiner, S., 2010. Microarchaeology: Beyond the Visible Archaeological Record, Cambridge University Press. The west-coast of Saudi Arabia is a desert landscape with temperatures ranging between 22°C and 38°C. There are no rivers or lakes and the maximum rainfall one can expect per month is only 22 mm. Data from environmental proxies indicate that these conditions have been the same for the last 7,000 years (Lézine 2014). However, this did not keep people from living there. 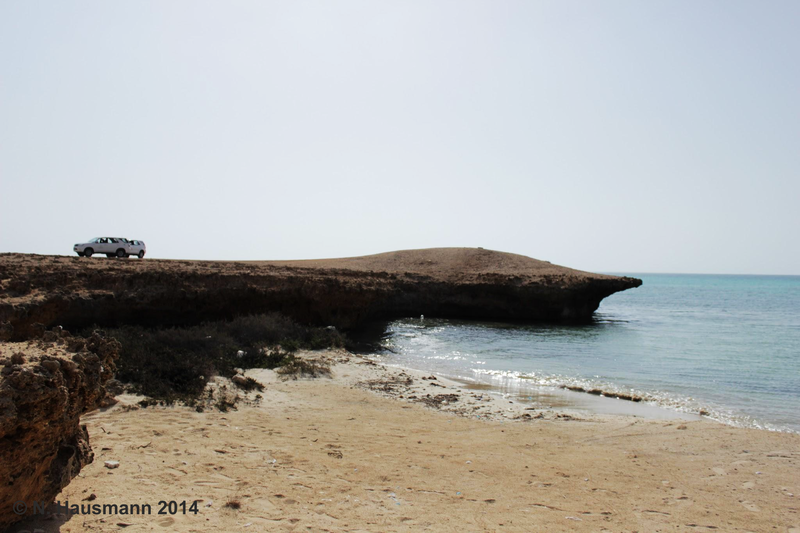 Vast amounts of coastal sites were found all over the southern coast of the Red Sea (Meredith-Williams et al. 2014). Most of the known sites are located on an archipelago called the Farasan Islands (www.disperse-project.org). Excavations and surveys in 2006-2009 found over 3,000 sites on the big islands alone (Bailey et al. 2007). The main part of the sites is made up of shell middens, this type of site can be found all over the world (Colonese et al. 2011, Estévez et al. 2001, Gutiérrez-Zugasti et al. 2011, Rabett et al. 2011), examples in the UK include shell mounds on the Isle of Portland (Mannino and Thomas 2001). Shell middens are the leftovers from people collecting and processing molluscs and then depositing the remains on the beach. But many middens do not only contain shells. They also contain other food remains, burials, lithic tools, housing structures, etc. Picture of basket remains in section of shell midden Cubatão, Brazil, 3,000 cal. B.P. It is the rigid structure of the shell as well as its chemical composition that works like a shelter for artefacts and bones. This also means that sometimes the only finds that are preserved can be found inside the middens, making them a prime location to look for intact material which later can be used for scientific analyses (e.g. residue analysis (Heron et al. 2007)). The shells themselves can be used to ask questions about food preference and subsistence strategies. How many oysters did people eat? Did they prefer to eat fish or other mollusc species (Álvarez-Fernández 2001)? But also, was the local marine environment possibly unsuitable for some species? Can we see a change in marine environment that is reflected in a change of species throughout time (Carbotte et al. 2004)? These are all questions that can be looked into by analysing the animal remains and the taxonomic data. For Farasan we try to answer other questions as well. For example we analyse the elemental and isotopic composition of the shell growth rings to reconstruct the temperature that the shells lived in. For this δ18O values from the shell carbonate (δ18OS) can be used in combination with the water composition (δ18OW) to calculate an estimated temperature using the equation below (Dettman et al. 1999). This can help us to understand what the temperatures were like in the past but also how dry or humid it was. This is especially interesting in desert landscapes like Saudi Arabia. Furthermore, by sampling multiple growth rings in a line the temperature reconstruction can be used to find out about the seasonal change throughout the year. Goodwin et al. 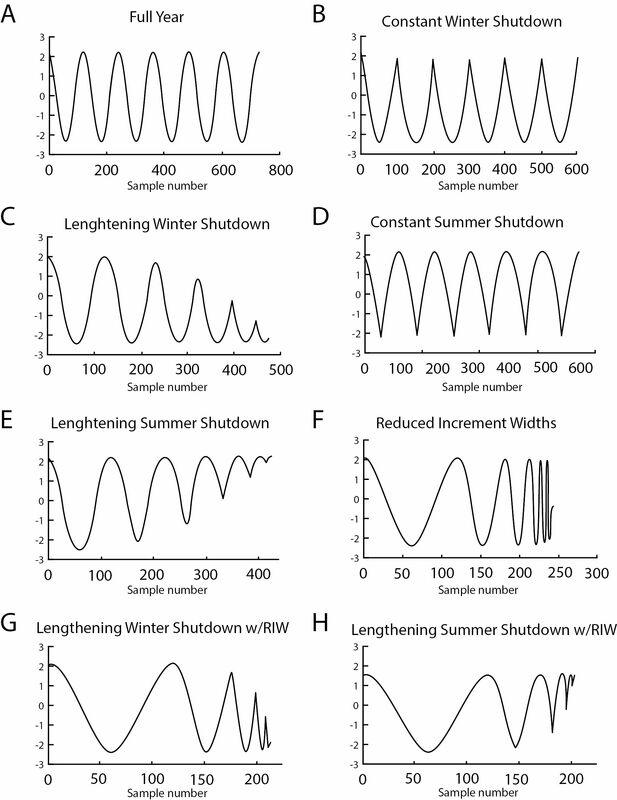 (2003) described the change in the seasonal curve for different scenarios. Simplified δ18O profiles (Goodwin et al. 2003). However, the isotopic change is different for every shell species and different in every environment. The scenarios only illustrate what characteristics can be found in data. The seasonal isotopic change in the shell carbonate can also indicate at what time of the year the mollusc was killed and when the people who made the shell midden ate it. Eerkens et al. (2013) used this technique to track people’s movement within the San Francisco Bay area. On Farasan we will be able to look if people moved to and from the islands at specific times of the year and if there has been a strong connection to the Arabian mainland. We could find that people stayed on the islands for the whole year to enjoy the rich marine wildlife. 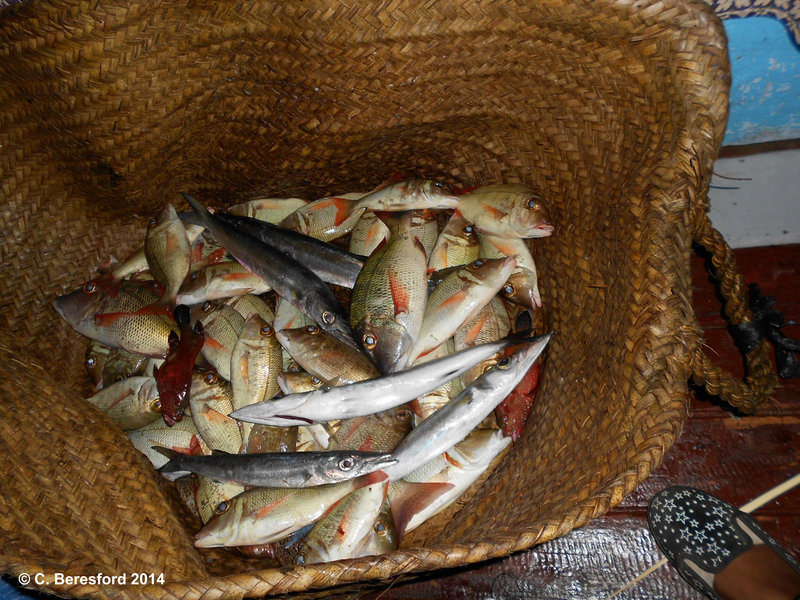 Marine Resources: Fish in a Basket. Fishing in the Red Sea. Niklas Hausmann is a PhD Researcher within the Department of Archaeology at the University of York. 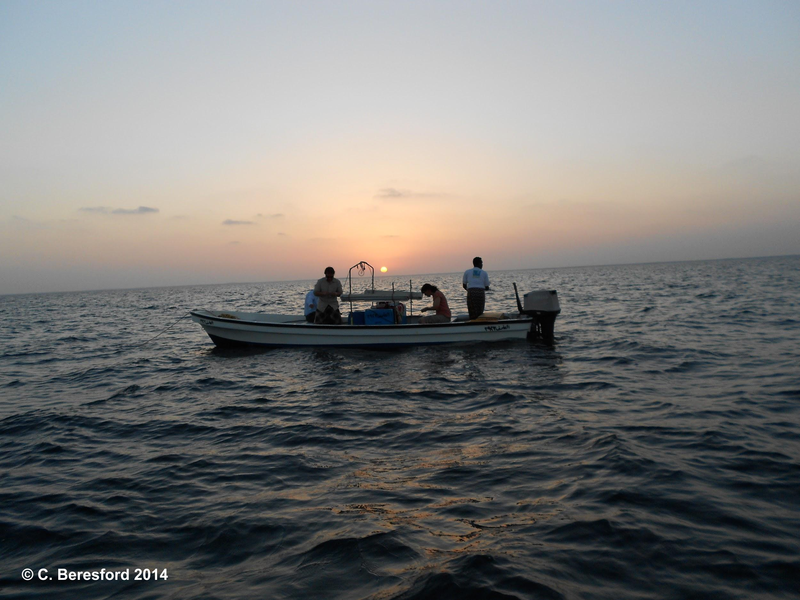 His research is part of the DISPERSE Project, working on the Farasan Islands in the southern Red Sea. His research examines the isotopic composition of shells on the Farasan Islands, which feature more than 3000 shell middens, using the isotopic signature as an environmental proxy for sea surface temperatures (SST). Niklas hopes that the resulting understanding of seasonality can reveal subsistence strategies of local prehistoric populations, revealing gathering strategies and shellmound construction methods. Abundant shells within each layer of the middens provide a high density of samples, providing a high resolution dataset reflecting pre-desertification coastal exploitation in Saudi Arabia. Niklas undertook a BSc in Prehistoric and Historic Archaeology with Geosciences at Christian-Albrechts-Universität (CAU) Kiel, Germany, his dissertation focussed on the analysis of Kongemosian and Ertebølle lithic technology and faunal assemblages from Satrup LA 2. He then completed an MA in Mesolithic Studies at the University of York, focussing on spatial analysis of lithics from Duvensee 13. He is due to complete his PhD in September 2015. Álvarez-Fernández, E. (2011). “Humans and marine resource interaction reappraised: archaeofauna remains during the Late Pleistocene and Holocene in Cantabrian Spain”. Journal of Anthropological Archaeology, 30(3), 327-343. Bailey, Geoff N., Nic C. Flemming, Geoffrey CP King, Kurt Lambeck, Garry Momber, Lawrence J. Moran, Abdullah Al-Sharekh, and Claudio Vita-Finzi 2007. “Coastlines, submerged landscapes, and human evolution: the Red Sea Basin and the Farasan Islands.” The Journal of Island and Coastal Archaeology 2, no. 2 : 127-160. Carbotte, S. M., Bell, R. E., Ryan, W. B. F., McHugh, C., Slagle, A., Nitsche, F., & Rubenstone, J. 2004. “Environmental change and oyster colonization within the Hudson River estuary linked to Holocene climate”. Geo-Marine Letters, 24(4), 212-224. Colonese, A. C., Marcello A. Mannino, D. E. Bar-Yosef Mayer, D. A. Fa, J. C. Finlayson, D. Lubell, and M. C. Stiner 2011. “Marine mollusc exploitation in Mediterranean prehistory: an overview.” Quaternary International 239, no. 1: 86-103. Dettman, D.L., Reische, A.K., Lohmann, K.C. 1999. Controls on the stable isotope composition of seasonal growth bands in aragonitic fresh-water bivalves (Unionidae). Geochimica Et Cosmochimica Acta 63 (7–8), 1049–1057. Eerkens, J. W., Byrd, B. F., Spero, H. J., & Fritschi, A. K. 2013. “Stable isotope reconstructions of shellfish harvesting seasonality in an estuarine environment: implications for Late Holocene San Francisco Bay settlement patterns”. Journal of Archaeological Science, 40(4), 2014-2024. Estévez, J., Piana, E., Schiavini, A., & Juan‐Muns, N. 2001. “Archaeological analysis of shell middens in the Beagle Channel, Tierra del Fuego Island”. International Journal of Osteoarchaeology, 11(1‐2), 24-33. Goodwin, D. H., Schöne, B. R., & Dettman, D. L. 2003. Resolution and fidelity of oxygen isotopes as paleotemperature proxies in bivalve mollusk shells: models and observations. Palaios, 18(2), 110-125. Gutiérrez-Zugasti, Igor, Søren H. Andersen, Ana C. Araújo, Catherine Dupont, Nicky Milner, and Antonio M. Monge-Soares 2011. “Shell midden research in Atlantic Europe: state of the art, research problems and perspectives for the future.” Quaternary International 239, no. 1: 70-85. Heron, C., Craig, O. E., Forster, M., Stern, B., & Andersen, S. H. 2007. “Residue analysis of ceramics from prehistoric shell middens in Denmark: Initial investigations at Norsminde and Bjørnsholm”. Shell Middens in, Atlantic Europe, 78-85. Mannino, Marcello A., and Kenneth D. Thomas 2001. “Intensive Mesolithic exploitation of coastal resources? Evidence from a shell deposit on the Isle of Portland (Southern England) for the impact of human foraging on populations of intertidal rocky shore molluscs.” Journal of Archaeological Science 28, no. 10: 1101-1114. Lézine, Anne-Marie, Franck Bassinot, and Jean-Yves Peterschmitt 2014. “Orbitally-induced changes of the Atlantic and Indian monsoons over the past 20,000 years: New insights based on the comparison of continental and marine records.” Bulletin de la Societe Geologique de France 185, no. 1: 3-12. Rabett, Ryan, Joanna Appleby, Alison Blyth, Lucy Farr, Athanasia Gallou, Thomas Griffiths, Jason Hawkes 2011. “Inland shell midden site-formation: Investigation into a late Pleistocene to early Holocene midden from Tràng An, Northern Vietnam.” Quaternary International 239, no. 1: 153-169.